And let’s not forget the arbitrary restrictions on your character. Why can’t my Thief use the Holy Avenger? Did magic make me forget how to hold a damn sword? Too true! This game is the worst. American RPGs are truly in crisis. The only bright spot is Witcher 2. That game is perfect. No flaws. Most of your complaints are nothing of major. BG2 is best rpg ever, not a worst game ever. Choices you’ve made in BG1: Yes, there are lot of choices you’ve made in BG1 that BG2 ignored. However, they are minor things. Xzar’s return is no more than a simple joke. To show that this is stll the same game in different time span. And perhaps to hint, there are many ways for people to come back from death — like when you use ressurection spells on your party memebers. As for Minsc, Jaheira, Imoen, as soon as you are out of Irenicus’s dungeon, you don’t need to have them in party anymore. No one forced you to take them around. There are plenty of other wonderful NPCs to choose from or you can solo if you’d like. This is not a valid complaints. Choices you’ve made in BG2: You were pretty forgiving about DA2, so why are you so harsh on BG2? You say it doesn’t make any difference whether you choose between shadow thieves or vampires. Well, same goes in DA2. Whether you’ve chosen to side with Templars or mages, you still end up fighting with them both. Worse, in DA2 that happens regularly (e.g. no matter what you do with Grace and mages, you end up killing them in “Best served cold” quest anyway). It happens once in BG2 and you make it sound like the whole game ignores choices you’ve made. Reused area/tile set: Have you really played BG2? Have you finished the game? The game covers vast area of lands, and they all have unique drawings/landscape. One of the things BG2 is known for is, beautiful art work of each different area. And, again, you think DA2 is a decent game, and it has more recycled area than any other game I’ve ever played/known. And yet you didn’t complain about that point in your review for DA2. The whole “game is rushed” is not good enough excuse. Limited exploration option: Duh. This game was never meant to be an open end game. It was suppose to be linear as it is story based, and it delievers it so beautifully. Don’t look for things that game didn’t offer in first place. The game is idiot proof: What, so you are saying technology is for idiots? It was just simple evolution of game. I didn’t see you complaining about that in DA/DA2. Whenever you pick up a quest in DA/DA2, it directs you where to go with arrow on the map. Seriously, if you are going to complain, try coming up with something more sensible. Romance over plot: The game doesn’t force you to have romance. You have a lot of chance to tell your NPCs, you are not interested. Your romance only adds few more side-quests, it doesn’t affect main plots in major way. If anything, the choices you make for your romance options, does have consequences. This denies your claim of “BG2 has no real consequences”. If you follow romance with an NPC, Bohdi abduct your lover and you have to fight to get your lover back. Again, I didn’t see you complaining about romance in both DA/DA2. DA2 was far more worse if you wanted to complain about romance. In DA1, out of 8 possible companions, 4 of them were romanceable regardsless of your Warden’s gender. In DA2, out of possible 6 companions, 4 of them were romanceable since all of them are bisexual. In BG2, out of possible 16/17(ToB) companions, only 3 of them were romanceable for males and only 1 romanceable for female protagonist. So I don’t see how this is valid complaints. I’m not saying BG2 is a perfect game — there are never a game or product that have no flaws. But by far, BG2 is greatest of all RPGs, and to see someone shut their eyes and try not to see good side of them makes me feel sorry for them. blob: Thanks for the great comment! I’m going to let you in on a secret, this post is a joke. I don’t actually hate BGII or think it is an awful game. Quite the opposite, in fact. I’ve played the game (to various states of completion) at least a dozen or more times – in fact I played through BGI & BGII as recently as this summer. BGII is my gold standard for Western RPGs. I am more than a little obsessed with Bioware games, in general. It is good that you bring up my opinion of Dragon Age II in your comment, for this post is actually (and strangely) about that game. It was written in a mental state shaped by my reading of too much blogging and Kotaku commenting about that misbegotten game. I felt that the internets discourse on DAII had reached the point of criminal insanity. (It has actually gotten worse, I feel since September) As I note in my post about Dragon Age, I feel that the DAII has flaws but they aren’t fatal. What I thought I would do with this post is suggest that some of the “problems” that your average drunk Kotaku commenter harps on and on about with DAII are reoccurring issues in *all* Bioware games. I could have picked, say, KOTOR but decided my point would be made best by going after the sacred cow – BGII. So, I took some minor flaws present in BGII (and all Bioware games) and exaggerated them out of all proportion to make my point. Perhaps, I did not make the parody in this post clear enough and for that I apologize. I really like this post and it always makes me smile when I re-read it. But again, thanks for commenting! I hope you come back when I post more content here (which should be coming shortly!). this site is the worst ever, BG2 is just epic in every way, if you can’t see that then please keep your opinion to you and continue playing witcher (gay cough cough), for a reason people rate BG2 so high. This is one of the most hilariously awful comments I have ever read. If you look right above your waste of text you will find an explanation that this post is a parody. Perhaps you’ve heard of that literary device? Also: I wonder why you believe Witcher is “gay cough cough”? Is that game some sort of homosexual flu? ROFL, you actually fooled me right until “pretty linear” came up. what the… this is a joke? and i thought that in this terrible and lonely world someone will understand me and my BG2 misery. oh well i did enjoy turning many npc’s into squirrels. I stumbled upon this post/site randomly as I was searching something on google regarding BG:EE. I was quite taken back by how preposterous the complaints are, and had filed you under the “idiot” tag in my undocumented appendix to the internet. Then I read the comments, curious to see how people reacted and got to the post where you explained the nature of the original article. Haha. Well done. Yes it is rather impossible to decipher that the original is a parody without context, but after reading the state of mind you were in, it makes a lot of sense. I remember a lot of the debate surrounding DAII when it came out, and while I have never played, I also never will largely because it is not a true sequel to DAO (a game I LOVED). I am a huge CRPG fan, but a rather conservative one. I do not care much for the console-ization of games in the genre in recent years and certain game evolutions downright depressed me (I feel Morrowind is laughably superior to Oblivion, and to an extent even Skyrim). Thanks for the comment, Vlad! If you’re interested in video games and the sort of snark/commentary in this post I’d check out the podcast (http://adulthoodpending.com/yckmd/) we’ve started in 2014. As for my personal tastes in CRPGs, they are increasingly moving away from open-world games (like Elder Scrolls) and more towards tight character/story focused games. Which is why I’ve found DA2 and the later ME games (and Japanese games like Persona 3 & 4) very much too my tastes. To tell you the truth, I honestly DO hate BG2 compared to BG. Parody or not, your statement about linearity is in fact, true. One of my greatest joys from BG is feeling vast control over where I can go and what area I can explore, even if those areas can easily kill me. If I play cleverly and “meta-game” it I can brave higher levels areas regardless of my progress in the main plot. There are also a higher variety and number of small side quests for you to fetch around before ever returning to the main plot. In BG2, your path is set on “forks.” You choose either go here now or later, or one over the other. Side quest are forced in your face in big chucks, like “ok, you can either go grind in this side quest, or this one.” They don’t come spontaneously when you explore the world like in BG. Funny enough, I also agree with your “joke” statement on npcs. I did not enjoy so much intimate dialogue with npcs. In a game like Mass Effect where your npcs truly are part of the plot/cut scene/progression, i’m fine with it. But in BG2 it’s just walI of text going back and forth like a romance/text sim game or something. I did not like having a small focused number of BG2 npcs with a bunch of stuff to say. I much preferred the more vast selection of npcs in BG and some OCCASIONAL conflicts and side story. My other gripe have to do with BG2’s implementation of DnD spells. BG2 is WAY too focused on magic defense and “breaching” that defense, it gets damn tedious. Do you know how long it is to program the “romances” that take place with a dozen NPC’s in the way that Bioware did it? Like a day – at most. They’re simplistic trigger events that take next to no time to program in. Complaining about “dedicating time to that” is like complaining that you don’t like the look of a specific tree somewhere in the game – it’s a small element of little to no consequence. This does’nt even make sense. BG2EE ist exactly the same game as BG2 vanilla – with a much better interface, and some additional NPCs to boot. How, exactly, can you be a fan of BG2 and at the same time hate BG2EE, seeing that they are essentially identical? Pff i don’t even know why i bother. Bg2 does not need an “official” new interface or content unless it’s more of the same, do you add stuff to mona lisa just because it’s old and techniques they used at the time were old, no you don’t. Would be fine if it’s a mod. Only thing that was up to par was the voicing of new npcs, other than that it was shallow, unprofessional, reeked of an any mod ever, generally unrewarding, stupidish and boring, and cliche..perfect example of where game industry went wrong they even made a super hot vampire you can’t shack omfg are you kidding me? 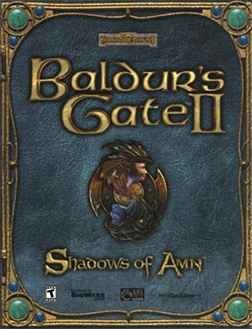 BG2 is still a great game but there’s a different charm to BG1 that is unforgettable. That game is simply amazing. THANK YOU. Replaying both of them 15 years later, Baldur’s Gate 1 was a *masterpiece*, and Baldur’s Gate 2 was horrendous right out of the gate. Deus ex-machina/forced capture plot devices, zero world exploration that is not on rails (take a look at the world map of BG1 when you’ve visited every area and compare it to BG2: there is an entire disc or more worth of material they didn’t bother creating), terrible dialogue writing. It seems fitting that the *one* section of the story that comes close to redeeming it is lifted straight out of the Menzoberranzan game that came out half a decade earlier. It always boggled my mind that this game got the highest praise possible for a video game–which just goes to show how much the afterglow of BG1 affected people’s perceptions of this game. PS: how cowardly to pretend this was a joke just to appease the bg2 fandrones! (This comment is partially in jest.) BG2 must have a reckoning for its crimes.